One of America's most influential unions is going to bat for beleaguered Iranian truck drivers. The International Brotherhood of Teamsters has thrown its support behind the Iranian truck drivers protesting diving wages and increased costs in the industry. Teamsters president James P. Hoffa sent a letter to Iran's deputy director of the Interests Section Abolfazl Mehrabadi calling on the regime to begin recognizing workers' rights. Hoffa said Iranian truck drivers face high road usage fees and resistance to organizing and collective bargaining in the country. "Drivers have advised us of low pay, increasing operating costs, and road usage fees and a refusal by your government to recognize the rights of these workers to form trade unions of their choosing," Hoffa said in the letter. Iran did not respond to requests for comment sent through the Pakistani embassy. 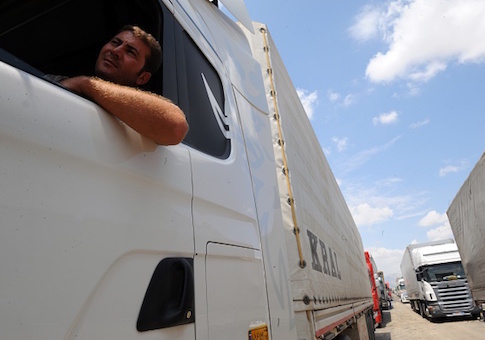 Iranian truck drivers began voicing their opposition to the state of the industry in May, but the regime's promises to address their complaints have gone unfulfilled. Truck drivers renewed the protest in September, blocking traffic with their semis to raise awareness. Hoffa sent a letter stating his solidarity in May but renewed his push for workers' rights after witnessing continued abuses of workers. "We urge the government of Iran to listen to the grievances of striking Iranian truck drivers, address their just demands and recognize their internationally recognized rights to assembly, speech, freedom of association, and collective bargaining," Hoffa said in the letter. Drivers are striking in nearly 300 cities in 31 states to protest their working conditions. They have not been shy about their grievances despite the regime's oppression of dissent, sharing videos on social media of trucks parked on busy roads. Since September, Voice of America, a government agency that seeks to advance U.S. interests abroad, has publicized those images to demonstrate the discontent residents have with the Iranian theocracy. The strike has captured the attention of the Teamsters, which represent more than 1 million trucking and warehouse workers. The union said the Iranian regime needs to give workers "a greater voice" in employment conditions and heed their calls about the state of the shipping industry in the country. Watchdogs of the Iranian regime, one of the world's largest state sponsors of terrorism responsible for killing thousands of Americans, praised the labor union for shedding light on how the government treats its own citizens. Richard Goldberg, a senior adviser to the Foundation for the Defense of Democracies, said the protests demonstrate the unrest in the country and unhappiness among citizenry. Goldberg called Iran "an equal opportunity oppressor" in its treatments of minorities. Although much of western focus on Iranian repression is directed toward women's and gay rights, the country's record on working conditions is equally troublesome. "If you're a union member, you will be repressed," Goldberg said. "The Teamsters have long advocated for oppressed laborers in Iran—a helpful reminder that the issue of Iran's brutality and repression has never been and should never be partisan."